I was working on an Obama coffee mug project with porcelaine paint, and, as usual, got curious about where else this porcelaine paint could be used. 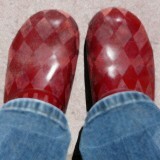 I looked down at my grungy leather clogs and decided to experiment. I painted cool swirlies directly onto the faded leather, and as a result got a new pair of whimsical leather shoes. I’ve had this pair for over six months post-paint, and can tell you the paint does not chip off. So, before you throw away your leather shoes or pass them down or donate them to charity, have some fun and bring back a bit of life to the faded leather by painting them with porcelaine paint (which you can get at a craft store). I experimented a second time with suede leather clogs. The harlequin pattern makes me happy every time I wear them! 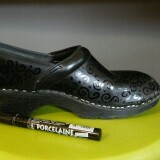 The porcelaine paint creases with the leather, but does not chip off. Here’s a follow up pair of shoes. It’s the same black pair I painted above with black porcelaine swirls. This time I went all out and created a wild pattern, painting the front all pink with dark green zebra (or tiger) stripes, and the heel a dark green with pink trim. Go ahead and try painting your own pair of shoes. Buy a cheap but good pair of leather shoes at a thrift store and pim them up! I love love love these shoes! I want to make some just like the brown with green flowers, I have located the pebeo porcelaine paint but I have a question. You mentioned that you used amber and ivory for the dots and the center of the flowers but what color green did you use? I am looking at their palate and it looks like you used the transparent type but it’s hard to tell if your color was emerald or bronze green. Can you recall? You are right. The green is emerald. Just be aware that if you are painting on a dark color, you should put white down first, then the color over it. These are so pretty! Do you have to use a lot of the paint (like several markers per shoe) to get good coverage like this? I just adore the way your mind works, Marty!